is the author of Cranioklepty (2009) and Afterlives of the Saints (2012). His work has also appeared in LA Review of Books, and he is a regular contributor to Lapham’s Quarterly. He lives in California. Since 2007, the Svalbard Global Seed Vault has maintained a repository of the world’s agricultural heritage. A series of tunnels bored into the side of a mountain, this vault is climate-controlled, secure against tectonic activity or sea-level rise, and designed to hold up to 4.5 million different seed varieties for centuries to come. Built 900km north of Europe in Svalbard, a barren archipelago in Norway, it sits on the edge of the Arctic Ocean, containing duplicate specimens from other seed vaults scattered throughout the world. There are more than 1,000 crop diversity collections worldwide, but the Global Seed Vault in Svalbard was built away from civilisation because it is the fail-safe, the insurance policy, the last resort. You take a switchback road up a hill to get to the vault, where it juts from the side of a slope a few hundred feet above sea level, looking like a grim, grey tunnel extending out of rock, snow and lichen. Below the entrance is a tiny ravine, and a small bridge one has to cross to reach the vault. Above the vault, Dyveke Sanne’s art installation runs the length of the roof, then spills over the top down the front, ending just above the door. It consists of a series of irregular blue-silver shards, suggesting fractured and disappearing ice. Below this decorative façade, however, is a less welcoming sight: an industrial, slate-coloured door, chained and padlocked. Unsure exactly what to do, I milled around outside with a few other visitors. We exhaled visible vapour, while taking in the stillness of Longyearbyen, the main settlement on the island. Even in summer, when tourist season is at its height, it’s far from bustling here. You quickly get used to the frigid silence that surrounds you. Since its inception, the Svalbard Global Seed Vault has repeatedly evoked a sense of the apocalypse. Everyone from Fox News to Wired magazine has used the unofficial nickname ‘doomsday seed vault’ to refer to the project, and it is routinely described as a last haven and refuge for plant biodiversity should some global catastrophe destroy the world’s crops. ‘The “doomsday” vault is designed to keep millions of seed samples safe from natural and unnatural disasters: global warming, asteroid strikes, plant diseases, nuclear warfare, and even earthquakes,’ National Geographic reported in 2008. Wired, in 2011, referred to it as ‘the world’s insurance policy against botanical holocaust’. This was a few years after the spectre of nuclear holocaust began to recede, as though the resolution of one man-made threat cleared the way for a new nightmare scenario. Within a few years, the chemical compounds CFCs were banned from use in refrigeration, solvents and aerosols, and the ozone layer — as a talking point, rallying cry, and apocalyptic scenario — all but disappeared from public conversation. But like doomsday clockwork, a new ‘greatest crisis humanity has ever faced’ arrived, this time in the form of global warming. The entrance to the Svalbard Seed Bank. Contemporary culture seems accustomed to hopping from one apocalypse to the next. This isn’t entirely bad in and of itself; the apocalyptic language surrounding the ozone layer hastened action on the CFC ban, just as Rachel Carson’s doomsday prophecies in Silent Spring (1962) accelerated the banning of the anti-malaria insecticide DDT. Apocalyptic language works, particularly in an easily distracted culture. It is perhaps the only thing that does work. ‘The more clearly we can focus our attention on the wonders and realities of the universe about us, the less taste we shall have for destruction,’ Carson said in a speech in 1963. But perhaps Carson had it backwards: perhaps it is our attraction to disaster stories and 11th-hour crises that allows us to focus our attention on nature and to marshal energy towards its preservation in the first place. Along with the language of catastrophe comes a very specific articulation of time. We think of our relationship to the environment in the immediate. Global warming, we’re told, will decimate all life within our lifetimes, or in our children’s lifetimes. In this way, environmental discourse resembles the ranting of religious millenarians, who stubbornly maintain that the apocalypse will happen on their watch. As of 2010, 41 per cent of Americans say that they expect Jesus to return to Earth by 2050. This obsession with impending disaster suggests that we see nature on a particularly human, individual scale. When we think of environmental damage and the human impact on the ecosystem, we think almost exclusively in the short term. The millennium, be it religious or environmental, is always coming the day after tomorrow. The workings of deep time are evident everywhere in Svalbard. In the days prior to my visit to the seed vault, I was out on the open seas with two dozen other artists and writers, travelling around the edge of Svalbard in a three-masted tall ship. We’d worked our way up the western coast of Spitsbergen, the archipelago’s largest island, dipping into the northern fjords before heading back. Again and again, I was impressed by the sheer stillness of the world around us. Aside from a few failed attempts by whalers, there were no permanent human settlements in Svalbard before the late 19th century, and there is no indigenous population here, save the reindeer and the bears. Even today, this place is remarkably devoid of human activity. We sailed around Svalbard’s edge at the height of the tourist season, and we sometimes went for days without seeing another ship. In Raudfjorden, a fjord extending in from the top of Spitsbergen, we rode a zodiac raft out to the Hamiltonbreen glacier. Getting too close to a glacier can be deadly: if it calves, the shard of ice hitting the water can send waves big enough to swamp a small craft. Last year, a piece of ice from a calving iceberg broke off and killed a nearby kayaker. While we were out at sea, another tourist, on a different expedition, was killed when she fell into glacier-cooled water so frigid it triggered an immediate heart attack. As we approached the massive slab of ice, we could see broken-off chunks of it drifting in the water outside the raft. They made a constant crackling noise, like a low, fine static. Though we were safe from immediate harm, it was less clear whether there was a longer-term menace in all that floating ice. Svalbard contains less than three per cent of the planet’s glaciers, but those glaciers are getting 60-70 mm thinner each year, and annually they add 13 cubic km of icemelt to the ocean, raising it by .035mm per year. None of this is trivial, but neither is it particularly visible or dramatic. When I returned home, a few people asked me if I’d seen evidence of global warming. It was a well-meaning question, but one that made little sense. What would evidence of change look like to a person who’d just arrived in a foreign place? How could I tell what was regular snowmelt, and what was some subtle clue of a catastrophic ecosystem failure? Anyone expecting an on-demand Hollywood apocalypse will be disappointed up here. ‘A glacier is an archivist and historian,’ Gretel Ehrlich wrote in The Future of Ice (2004). ‘It saves everything no matter how small or big, including pollen, dust, heavy metals, bugs, bones, and minerals. It registers every fluctuation of weather… A glacier is time incarnate.’ The time incarnated by a glacier operates on a very different scale, doled out in measurements far too small for humans to witness. The most dramatic videos of climate change — where you can actually see it taking place — are made by time-lapse, a process that converts non-human timescales to those that fit into our narrow perceptual filters. Time-lapse reduces days to seconds, and years to minutes, but the conversion can go the other way as well. When we expand our vision of the natural world from human time to geologic time, our own individual consciousness and the consequences of our action and inaction become thin strata in a geologic archive that contains aeons. Away from any trace of contemporary civilisation, I had begun to experience time differently. In the land of endless daylight, the sun prowled around the horizon, never rising, never setting. I felt as if I was suspended in a perpetual midafternoon, as though a single day had stretched into two weeks. Time seemed to stop or, at least, to slow to a crawl. And, in a sense, time does crawl here. In an environment that did not support any human habitation prior to the 20th century, where the permafrost almost entirely arrests decay, a footprint left in the lichen can last for years. Wood used to build 17th-century whaling stations still litters the beaches, and it’s all in surprisingly good condition. These undisturbed remains offer a clue to why the Global Seed Vault is located here on Svalbard. The land itself resists deterioration; even if the building’s climate systems were to fail, nature could help to preserve the seeds. 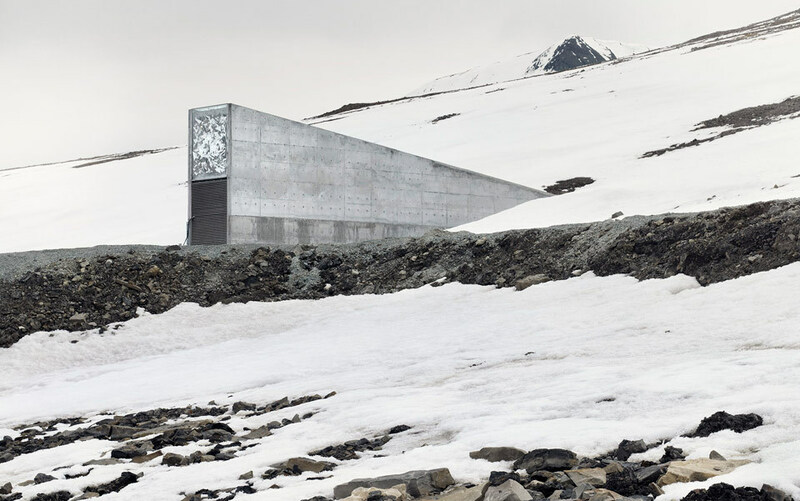 We tend to fixate on the remoteness of the seed vault, a place far away from short-term disasters that might imperil it. But it’s more important to notice its relationship to the landscape around it, a landscape capable of preserving the vault’s contents for hundreds of years, at least as long as the strange wreckage of whaling vessels that sit untouched along the archipelago’s shores. Svalbard resists thoughts that are limited to human time-horizons. Its scale is in millennia, not the current millennium. The closest thing to direct environmental impact that we witnessed was at Blomstrandhalvøya, across the fjord from the research base Ny-Ålesund. The suffix halvøya means ‘peninsula’, but here it’s a misnomer: the glacier that once tethered Blomstrandhalvøya to Spitsbergen has gradually receded, and in 1991 the peninsula became an island. It won’t be the last; as other glaciers recede, the archipelago itself will calve, as smaller islands ‘break off’ by virtue of the disappearing connective glacier tissue. Blomstrandhalvøya is also home to the abandoned marble mine of New London, built by Ernest Mansfield in 1911, after he convinced the Northern Expedition Company that there was high-quality marble here. There is indeed marble, but it’s of such brittle and poor quality that it literally fell apart on the ships bound for England. After two years, the NEC fired Mansfield and abandoned the settlement. A hundred years on, the ruins of New London are remarkably well-preserved. The ore carts are overturned and rusted, but still intact, resting next to heaps of marble piled up along the cliffs, as if the next ship bound for England will be arriving shortly. The piles of marble — deliberate, definitive remnants of human work — refuse to be reintegrated into the landscape. The Arctic allows New London to linger as a ruin, a testament to how difficult it is to make a quick buck in a place as inhospitable as Svalbard. I carried all these chilly, arctic visions back with me to Longyearbyen after our voyage was over. Standing outside the Global Seed Vault, listening to its mechanical, hulking breathing, I thought back to a walrus I’d seen off the northwest coast of Spitsbergen midway through our voyage. The walrus, curious at our presence on the coast of this desolate beach, at the edge of the uninhabitable polar sea, had cruised slowly past us, not more than 20ft from the shore. There was nothing subtle about him: when his head breached, he’d exhale noisily and laboriously, watching us watch him, before taking a heaving breath and disappearing once again below the surface. From this vantage point, you might almost mistake him for a drowning victim, the way his head seemed to pop up just long enough to take a panicked gulp of air before the water enveloped him again. But this is, of course, only a matter of limited perspective. Under the surface, these hulking beasts are graceful beyond measure, artful and elegant in waters only a few degrees above freezing. We’re losing crop diversity everyday in very mundane ways. We have many feed banks in the world but virtually none work on a secure multiyear budget and equipment failures and accidents, mismanagement are commonplace. Occasionally a feed bank will get in the way of someone else’s fight. We’ve lost feed banks in Iraq and Afghanistan not because they were a target but because they were in the way. This recognition of the work of seed banks like the one in Svalbard is quotidian, bordering on the banal, and it can help to refocus an attitude towards the environment that sometimes verges on the self-important. A proper relationship to nature must involve a sense of stewardship, to be sure, and a willingness to work for a better tomorrow. But it might also do well to be stripped of a histrionic sense of perpetual catastrophe. Places such as Svalbard can help us to think on a much longer, deeper scale — one in which we are peripheral characters in a drama taking aeons to unfold.